Thomas the Bank Engine loved driving down the High Street to where the Fat Director kept his money. He liked to pull lots of trucks, especially if they were loaded down with bags of golden sovereigns, and Mr Egmont, the Fat Director’s own director, liked to think up new wheezes to keep the trucks well loaded. In this instance he has thought up a pretty way to celebrate Thomas’s 65th birthday by reproducing the four stories about him that first came out in 1946 (they can’t do maths on that railway), printing them in a larger format than is customary, slapping them into a handsome binding, and tucking the lot into a smart, colourful slip-case. The edition is said to be ‘limited’, but we are not told to how many copies. The Fat Director probably won’t want to hear his customers murmur the word ‘pretentious’ (if he knows what it means), but, along with the mathematics, the thinking behind this enterprise is slipshod to a degree unfitting for a seriously celebratory volume. A meagre nine pages, begirt with questionably ‘rare artwork’, go nowhere in telling the intriguing story of the making of the book. Material appears to have been taken from Brian Sibley’s exhaustive study, The Thomas the Tank Engine Man (1995), which is nowhere acknowledged. And, as we learn from that book, the edition of Thomas published 64 years ago was illustrated by one Reginald Payne, while Mr Egmont is selling us a later reworking with the plates tidied up by the chap who became the regular series illustrator. Back in those days the Rev. 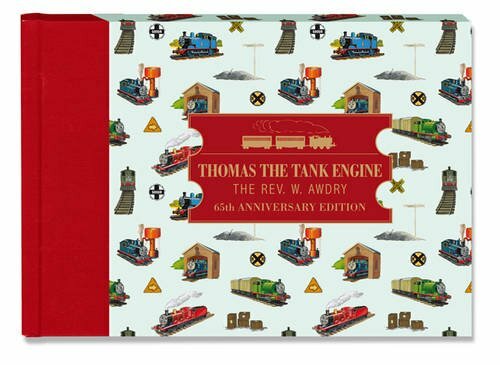 Awdry had a hard time of it -- an innocent novice being ripped off by his publisher and, to some extent, his agent. Now in heaven, he’s probably groaning about even more indignities.